Do you like cozy scale accomodations and a personal touch? The this is the place where you are looking for. We have eight modern rooms each with shower, toilet, free internet and color TV. Breakfast served in our cozy breakfastroom with its spectacular view of our bordering pastures. Evenings can be spent at our recreationroom where games be played and a drink or a snack may be had. Our guesthouse Zonneweelde is situated centrally between the century old cities of Edam, Volendam, Hoorn, Alkmaar and Enkhuizen. Amsterdam is reachable in a half hour by car. 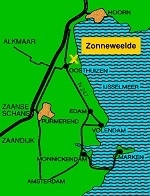 The IJsselmeer, 500 meters from Zonneweelde offers swimming, surfing and fishing. We are ideally situated for bicyclists and day travellers. Bicycles and an electric boat may also be rented at Zonneweele.